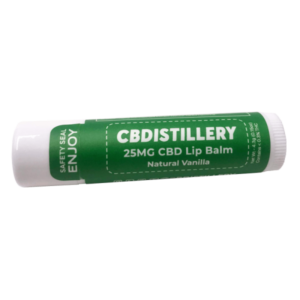 CBDISTILLERY’s Lip Balm. CBD now for your lips! Easy to apply, full spectrum hemp extract lip balm, combines all of the benefits of CBD with other natural ingredients to help smooth, moisturize, restore and help protect your lips. This balm has the same high-quality CBD you expect from The CBDistillery. It is an excellent addition to your daily CBD usage. Pesticide-free, non-GMO hemp CBD oil extracted from the mature stalks and stems of the hemp plant. Contains 25mg Hemp Cannabinoids. This can include natural Terpenoids, CBD, CBDA, CBG and CBN. Ingredients: (Castor) Seed Oil, Beeswax, (Carnauba) Wax, (Sweet Almond) Oil, shea butter, cocoa butter, Capric Triglycerides, Lanolin, Tocopherol, Acetate, Hemp Cannabinoid Extract, Natural Vanilla Flavoring.